After posting yesterday, I was informed that LWW was not the first to enter the small screen arena. The British Medical Journal (BMJ) released content for the iPad platform beginning in December 2011. This journal uses the built-in Newsstand app on the iPad or iPhone. On first look, it appears to be more robust than the LWW app for Neurosurgery. 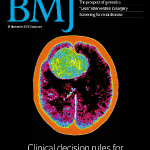 The BMJ allows access to other related content streams, such as their news, blogs, podcasts and video. It is a bit more interactive and does allow searching and bookmarking. Bottom line: I’m sure someone will step forward with yet another earlier entry into the smartphone/tablet arena. Regardless, it’s all good. Either Newsstand or independent app works, although the Newsstand offers some pre-built functionality for developers that might make it a bit easier to create. However, the Newsstand is also Apple-specific, and won’t work for all the people with Android or Windows based phones and tablets who will be screaming for this content. Previous PostThe Future of the Medical JournalNext PostCognitive Rest? ?